Make your application interface complete with a Ribbon style menu. Ribbon for WinForms delivers both Ribbon and Status Bar functionalities, with the same look and feel as Microsoft Office. This enables .NET developers to build Microsoft Office-style applications with little code and with great functionality. Located at the top of the screen, the Ribbon replaces traditional menus, toolbars, and task panes with a simpler system of interfaces. It organizes related commands (in the form of controls) into groups and related groups into tabs so that the commands are easier to find. Perform tasks efficiently with reachable and discoverable functionalities. Complete with ComponentOne's Smart Designer support, Ribbon for WinForms's no-code design experience provides easy customization of the Quick Access Toolbar (QAT), tabs, groups, and other interface elements. 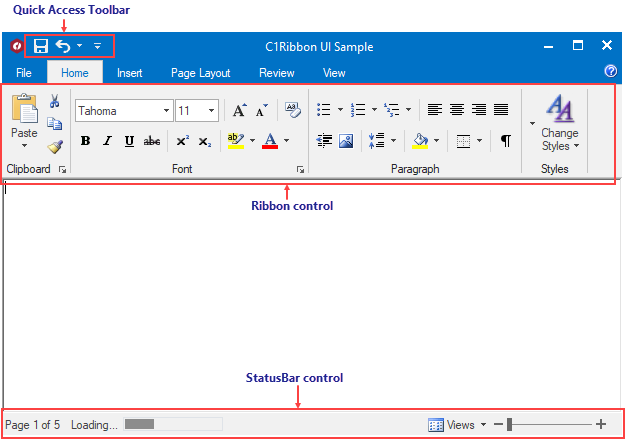 With Ribbon for WinForms, creating Microsoft Office Ribbon style menus is this easy.